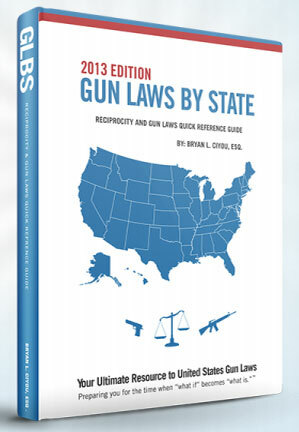 Indiana attorney Brian Ciyou has created an outstanding resource, Gun Laws by State (2013 Ed.) (GLBS), that explains firearms laws in all 50 states. Ciyou’s gun law treatise, available in both book and online (web) formats, covers state laws as well as key federal laws that apply in federal buildings, airports, National Parks, and school zones. There is a handy Reciprocity Map showing which states recognize concealed weapon permits issued in other jurisdictions. GLBS covers Reciprocal Carry for all 50 states, Constitutional Law, Federal Statutory Law, Use of Force, Criminal Provisions, Civil and Criminal Liability, Preemption, Federal Property Rules, and Interstate Transportation. Amazingly, you can access all this important legal information for FREE on the GLBS website. Click on an interactive map to quickly review gun laws in any state. Navigation links provide quick access to particular topics, such as rules for Airline Travel, Amtrak, National Parks, and Federal properties. The web version of Gun Laws by State is updated regularly, and Ciyou even provides a GLBS Gun Laws Blog with current “news and views” on gun regulations nationwide. This Editor regularly references the Gun Laws by State website. I suggest readers bookmark the site, and consider buying the book if you frequently travel with firearms outside your home state. The printed book version costs $19.95, while a digital eBook is $9.95. Click here to purchase GLBS books and eBooks. Share the post "State Gun Laws Resource Website, Paperback, eBook"
Great book! Although im all to familiar with the gun laws of NY…..